Madcap Experiment: Too Good in Modern? Kaladesh looks like it’s going to be great for Modern. There will be fair, regular, good cards like Smuggler’s Copter and there will be new enablers like Cathartic Reunion. But nothing is exciting the boys at Top Level Podcast like Madcap Experiment. Madcap Experiment is like a Tinker for one more mana… But that does not require you to sacrifice an artifact. The problem, of course, is that when you turn over all of those cards… Ouch! You don’t want to turn over too many, or you’re going to get dead… Unless the artifact you reveal is Platinum Emperion. This is “just” an 8/8 creature for four mana. Madcap Experiment into Platinum Emperion is the best Hunted Wumpus ever! Instead of a 6/6 creature with a drawback, it’s +2/+2 bigger and has a bonus! Madcap Experiment only has a single R in the top-right corner. This card is not only eminently splashable but it is an easy sideboard transformation. You can devote as few as six slots (four copies of Madcap Experiment and two copies of Platinum Emperion) and end up with a very serviceable pivot. It’s really tough to make progress against this combo. Dismember just doesn’t do enough. Decks like Affinity will have trouble in Game One. This isn’t a “combo” that wins the game immediately, it is simple to assemble, super cheap, and gives you a lightning quick way to kill the opponent. 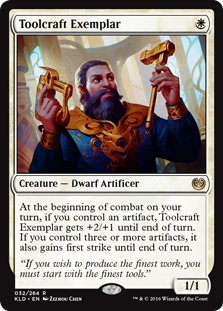 And Toolcraft Exemplar will be one of the best, and fastest (and not just in Standard). Will Dead Weight be better than Ruinous Path? If Patrick’s vision for the Kaladesh-upcoming Standard comes true, it will be! Toolcraft Exemplar is an obvious addition to a potential White Weenie deck, for instance. If all you do is play Thraben Inspector Toolcraft Exemplar will be a one drop 3/2 on offense. Given the low threshold necessary to get the bonus, Toolcraft Exemplar might be better than Wild Nacatl! Wild Nacatl is a Pro Tour winner and currently tearing up Modern, remember. Now adding Toolcraft Exemplar to White Weenie is obvious because of the Clue token synergy… But what about Smuggler’s Copter? Smuggler’s Copter… Better than all? Patrick has Smuggler’s Copter as his current top card for Kaladesh; it is an obvious addition to fast beatdown decks like White Weenie… And quite obviously gives you an artifact for your Toolcraft Exemplar. The learning curve on some of the new Kaladesh cards will be steep! 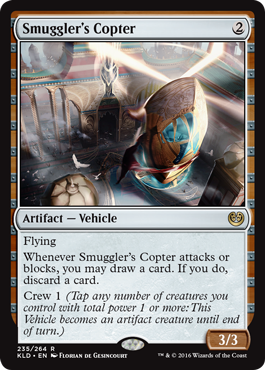 Smuggler’s Copter is a fast, flying, threat… That is also a Merfolk Looter. This isn’t an ability to be dismissed given the prevalence of the Madness mechanic in the previous block. But as for having more than one (sorry more than two) artifacts in play… the Exemplar will prove problematic. The first strike isn’t going to matter in a lot of games, until it does. This Dwarf Artificer is going to mess some folks up when they block lazily. These are two great cards, that will serve great beatdowns (and soon). 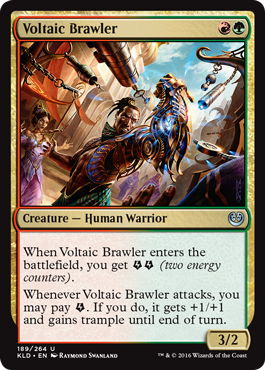 Voltaic Brawler will be the centerpiece of a new G/R Energy Aggro deck. Voltaic Brawler is an outstanding card. Even if Energy Aggro isn’t a thing — just a Gruul aggro deck of some sort — it will likely see play. There will likely be decks where Voltaic Brawler is the only Energy card. Voltaic Brawler is great when it is working right, due to the nature of the Energy mechanic. For example, you can lead on a second turn Longtusk Cub follow up with Voltaic Brawler, and either put (or threaten to put) counters on the Longtusk Cub to force it through a 2/2 blocker. It can stack with other Energy cards like Lathnu Hellion, or even take advantage of turn one via Attune with Aether. You can get in for four, get in for four again, and be left with a card that is on the order of Lambholt Pacifist (which just won both the Pro Tour and World Championship). Patrick outlines how Harnessed Lightning will play like Valorous Stance, and Mike points out how seamlessly accurate it will be relative to historical burn cards. Top Level Podcast also goes over Energy Ramp, B/G Energy Midrange, and intersections between the energy mechanic, and even Emrakul! All this and more in this week’s podcast! Will opponents consistently let you draw three cards? I mean if you can get that, you have accomplished much, because a 6/6 first striking Ancestral Recall for six mana is spectacular. We think opponents might give you three cards more often than you might initially think. Many opponents will live in fear of the idea that there are three Combustible Gearhulks waiting on top of your library. If you can stack the top of your library, this card gets better and better; imagine a format where Congregation at Dawn is legal: You can put Combustible Gearhulk on top of your deck with, say, Emrakul and Ulamog… Congregation at Dawn itself becomes a conditional Draco-Explosion! 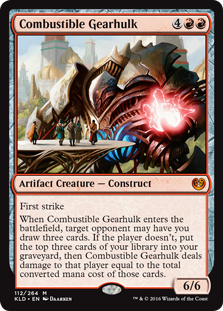 Combustible Gearhulk is best buddies with Saheeli Rai: Not only is Combustible Gearhulk a great card to nab with Saheeli’s Ultimate, a post-Gearhulk Saheeli makes for a great use of her middle ability. When you’re not actively trying, Combustible Gearhulk is still pretty good; however, remember that even Ramp decks with high casting costs need both cheap Ramp cards and [zero mana] lands to get their big spells out. Will you do ten sometimes? Yes. And you’ll do less than that, often, too. As long as we care about what the top of our libraries cost, Sorin, Grim Nemesis can provide a useful redundancy. The new set Kaladesh is bringing in some awesome new Planeswalkers. Isn’t that right Director of Magic R&D Aaron Forsythe? Those were quite the Nissa and quite the Chandra we were looking for, Aaron. Luckily Kaladesh has got some other options. [+1]: Untap target land you control. Until your next turn, it becomes a 5/5 Elemental creature with haste. It’s still a land. This first ability has amazing implications. First of all, Nissa, Vital Force is more than 80% of a Reality Smasher. Five mana; five power of haste. Sign me up? You aren’t forced to attack with the animated Elemental land, of course. You can leave up a 5/5 to block; or if you untap a red land, use it to remove one of the opponent’s threats. In either case, you can protect this Planeswalker. 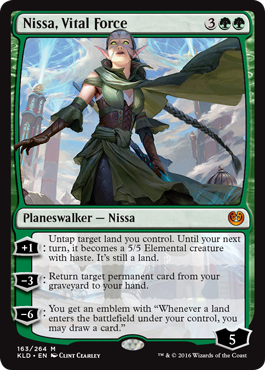 Nissa, Vital Force’s [+1] is a useful ramp ability (she takes you from five to seven)… But really this is about going straight to six loyalty to get her emblem. [-3]: Return target permanent card from your graveyard to your hand. Niss’a [-3] is great; in fact, Patirck points out that there is some Den Protector going on here. But the [+1] straight to [-6] is such a powerful incentive, look for this ability to be used less commonly than it might have been in other contexts. This is a shockingly potent Ultimate given how easy it is to set up. Consensus: This Planeswalker will be both a Staple and a Flagship. 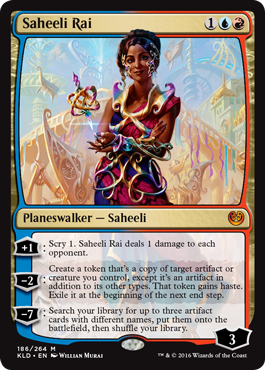 Saheeli has the worst fatal flaw of Planeswalkers (can’t defend herself), but as a three mana one, has something special going on. The comparisons to Jace, the Mind Sculptor are probably by design. 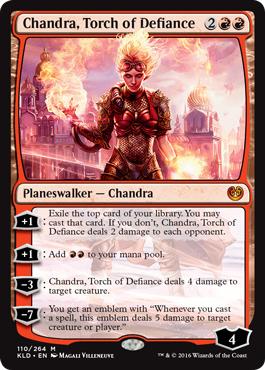 With the least of her abilities, Chandra produces mana more efficiently than Hedron Archive. Is Wild Nacatl a Great Choice for Naya Burn? The jury is still out on Wild Nacatl in Modern Naya Burn… But for now it is the accepted take. 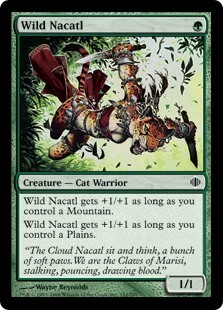 So… Is Wild Nacatl where Naya Burn players should be at for Modern? Mana base aside, this deck is only four cards off of the PPTQ-winning deck Mike played just a few weekends ago. But the four cards different are the one mana kitty cats in question. Patrick thinks the addition of Wild Nacatl — brining the creature count up to seventeen — might push Naya Burn from “The Lava Spike Deck” to “Red Aggro” … These are two different macro archetypes entirely from the perspective of Next Level Deck Building. 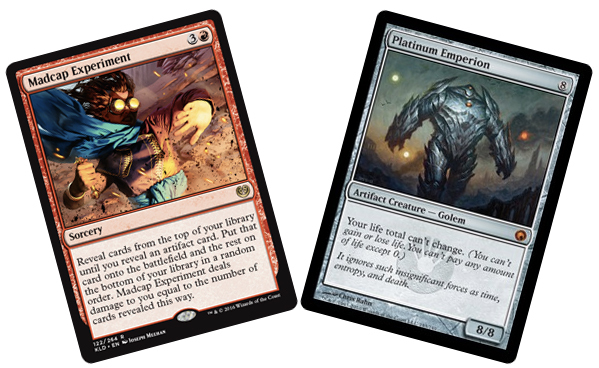 The difference in Modern is not trivial. When you are more purely a burn deck, mid-range opponents like Abzan and Jund are pretty easy to manage; but when you add Wild Nacatl, you can be fighting legit green creature decks on an axis where they are generally superior. On the other hand, Wild Nacatl — especially unopposed, especially on the first turn — “is like a Lava Spike every turn” (which is kinda sorta exactly what the deck wants to accomplish). Not trivial in the least. The more interesting creature addition (from Mike’s perspective at least) is Kor Firewalker out of the sideboard. Mike calls this “bringing a gun to a knife fight” and believes that if Kor Firewalker becomes the accepted tech for Naya Burn, all Naya Burn players have to start respecting it or they will fall behind in mirror match sideboard games. Kor Firewalker itself is an interesting card to play, being WW in a deck with Copperline Gorge, basic Mountain, and only twenty lands. Still, quite a breaker if you expect Naya Burn and Suicide Zoo. Patrick makes an interesting observation about this deck. It has relatively few cards “you would actually spend mana on” and an effective average casting cost of below 1. Yi’s version, with Traverse the Ulvenwald in the sideboard, can do some interesting things… Like find that basic Forest, or double up the ability to hit Ranger of Eos (without having to play a second copy of Ranger of Eos). Patrick and Mike both think Ranger of Eos is a perpetually underplayed card; in this deck it can get a hasty Monastery Swiftspear, or multiple Death’s Shadows. If all it does is find two copies of Wild Nacatl, Ranger of Eos is already a more mana efficient Broodmate Dragon (nine power over six mana instead of eight power over six mana, and starting up two turns faster). Is that four copies of Blood Moon? And main deck? “Why should anyone be allowed to do anything?” Sure, sometimes Blood Moon messes up Jund; but there are spots where it will mess the opponent up even worse. “Is Wild Nacatl a Great Choice for Naya Burn?” covers much, much more than a couple of green Modern decks, from the control side of Grixis and the various brands of Azorius; all the way to the mindset of a Hate Bears player. What is the Hate Bears Plan A, anyway?